The highly controversial Apple iPhone is finally getting a more reasonable price of GBP 169 instead of the original GBP 269. O2 UK and Carphone Warehouse who exclusively sell the iPhone in UK will be also giving GBP 100 vouchers to customers who have bought the iPhone in the last 30 days. The new price cut of GBP 100 (valid as of today) actually makes the European version of the iPhone less expensive than the US counterpart - the price tag pf GBP 169 translates into something roughly around $330, while the US 8GB version still costs $399 before taxes. The price drop actually makes us wonder whether O2 UK is having problems with selling their legit iPhones. Nevertheless, it's not sure whether this step will tame the black market of unlocked iPhones imported from the USA. After all, to get an O2 iPhone you have to sign a long-term contract with O2. While the iPhone 8GB gets its numbers slashed, the price of the 16GB iPhone version remains unchanged at GBP 329. This move from O2 opens doors to even more rumors about the expected announcement of a 3G iPhone in June 2008. 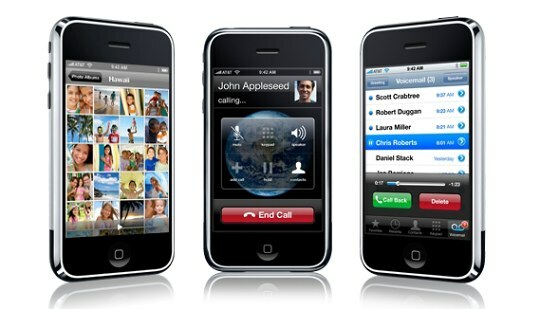 The new 3G iPhone is rumored to even boast a 32GB version. We are yet to see about that though. O2 told me today that the 16g has been withdrawn, but then they have lied to me about everything for the last 3 weeks, have paid up my account and gone to orange. Big news.... I work for O2 UK and we have been told to stop promoting the 8gb iPhone as it has been WITHDRAWN FROM SALE.